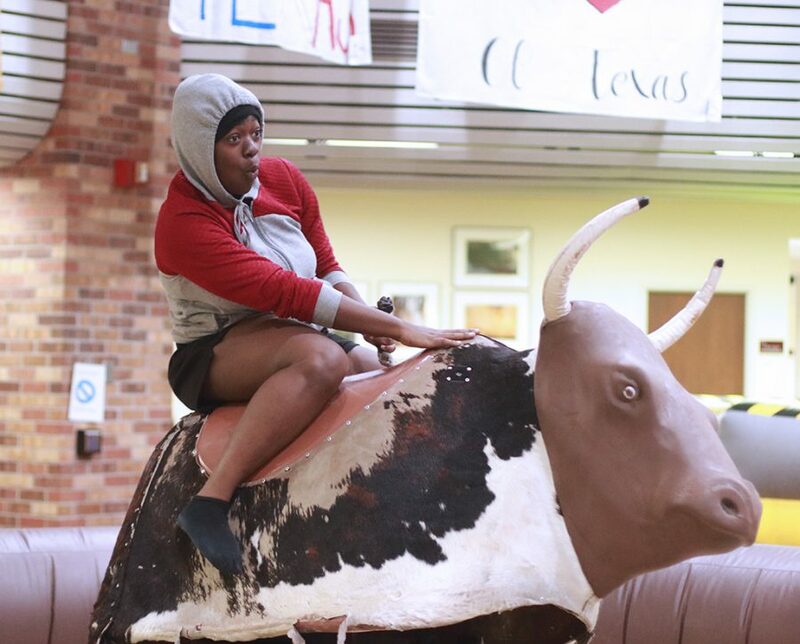 Giavonna Johnson, nursing freshman, falls off the bull at Maverick's 12th birthday party in CSC Comache Suites and Atrium Oct. 24. Some 250 students helped celebrate Maverick’s 12th birthday Oct. 24 in the Clark Student Center atrium. The event’s normal venue is Sunwatcher Plaza, but was changed because of the rainy weather. However, Ruby Arriaga, coordinator of student activities, was satisfied with the turnout. “So far, it turned out really good, we always have it in Sunwatcher Plaza however it is raining. Monday we looked at the weather, we changed it inside, the inflatables are inside and that’s kind of it. We made it happen, we made it work and it actually turned out pretty well,” Arriaga said. Keza Muvunyi, mass communication freshman, agreed saying the event it was fun. She attempted to ride the mechanical bull, but the ride lasted for a couple seconds. “It was fun. I just got done riding the bull and it lasted a couple of seconds, but it was fun. [The food] was good, I liked the toast and the cake,” Muvunyi said. Alexis Valenzuela, social work freshman, also enjoyed the event, saying it was fun. She also attempted to successfully ride the mechanical bull but got off as soon as she got on. For the rest of homecoming, the events she is looking forward are the bonfire and the dance. “I would probably say either the bonfire or the dance. The dance because I really like to dance and then the bonfire because I’ve only went to one bonfire and that was my senior year [of high school] so I’m really looking forward to it,” Valenzuela said. Munvunyi is also looking forward to the bonfire. “The bonfire and the torchlighting it just seems real fun and all the bonfires I’ve went to are super fun and the homecoming game,” Muvunyi said. While Ruby Arriaga is looking forward to all of the events and said lipsync and Chico Bean’s performance were awesome, and she’s excited for the fair. “For homecoming [activities] first of all, [I’m looking forward to] all of them basically and Lipsync was awesome so was Chico Bean, but tomorrow is the fair, it’s the first time that we’re bringing a little mini Texas Fair so I’m excited for that one,” Arriaga said. 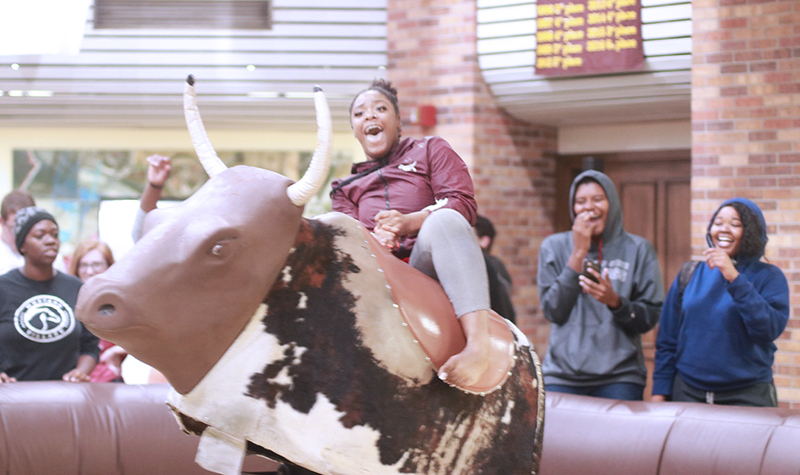 Trevonne Bradford, excercise physiology junior, rides the bull at Maverick's 12th birthday party in CSC Comache Suites and Atrium Oct. 24.